Yesterday, I posted an article about my recent judging experience. In it, I wondering what separated the very best homebrews from the rest, especially those that were fair to good, but not great. This is the conclusion to that article. In order to fix a problem, you have to properly identify it, and diagnose what is causing it. 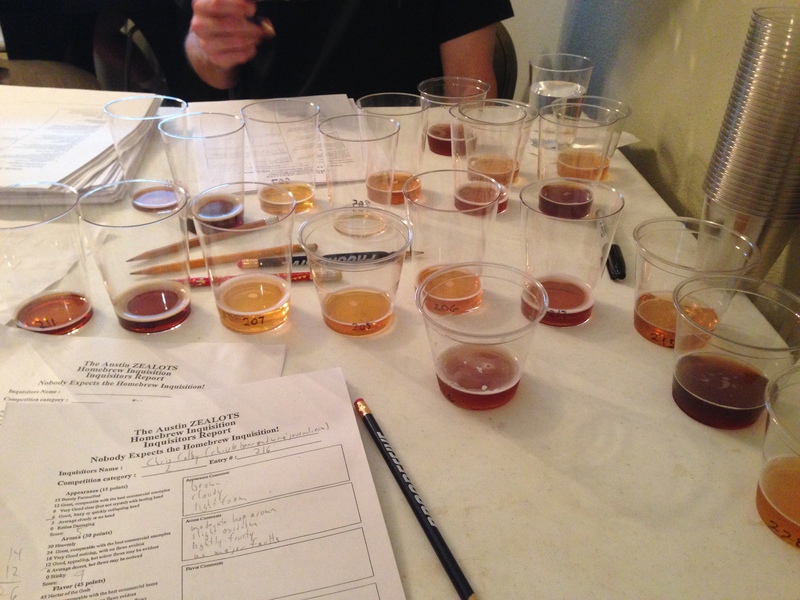 So, what separated the middling beers from the best in terms in the judging? Usually, it was a series of small things, rather than one factor that could be easily identified. In general, the middle of the pack beers tended to pour with a slight to moderate haze. The best ones were very clear. (Not filtered, crystal clear, but “I can read the words on a pencil through this” clear.) The best examples had a nice foam stand, with small bubbles, and foam that persisted and clung to the glass. Lesser examples had less foam and it disappeared more quickly. The best beers had fresh, enticing malt and hop aromas. For many beers in the middle, the overall intensity of aroma was low and what there was was not as appealing as that found in the best beers. They weren’t bad, they were just lackluster compared to the better examples. (Also, I will admit that judges can get their noses “blown out” when smelling beer after beer after beer. However, in the flights I judged, both of the judges went back to the beers we ranked the best to confirm our initial observations.) Likewise, the best examples had a great, fresh malt and hop flavor. In general, most beers had fairly decent body. Most showed levels of carbonation that were in the right ballpark and most showed no sign of (serious) fermentation faults or contamination to the degree of causing obvious off flavors. As I mentioned before, I felt that any of the “decent” homebrews I judged could have been great if a few key pieces of the puzzle had fell into place. Although they sometimes had an array of minor problems, I’m betting that a few underlying causes lead to all (or at least most) of them. Here are my suggestions for moving from brewing good beers to brewing great beers. My overarching idea is that if you pay attention to every detail, your beer will improve. As with just about everything in the world, to brew a really spectacular beer, you need to be “firing on all cylinders.” Cutting corners and time-saving techniques are fine if your primary goal is to brew beer quickly or easily. (And sometimes I’ve chosen that goal, so I’m not up on a high horse here.) However, if you want to brew superior beer, you need to perform each and every technique in a highly effective manner. You need to substitute the best procedures for those you can “get away with.” If the beer you brew is already fair to good, it should not take too much intervention to make it great the next time around. Here are some more concrete suggestions. The best thing you can do is taste your finished beers side by side with a few of the best commercial examples of similar beers, or the homebrew of others who are good at it. In the judging on Saturday, many of the middle-of-the-pack beers tasted fine. Tasted on their own, it might be hard to point to anything wrong with them. However, in a lineup with some better-executed beers, their deficiencies become more evident. So taste your homebrew side by side with beers you expect to be great, and look for ways that your beer could improve. Then tweak your procedures and recipe, as needed, and brew that beer again — if you brewed a good beer before, it should be better after a round of evaluation and adjustment. No great beer was brewed once, it’s a process of finding a good idea and then refining it to a higher level. Although taking any individual beer from good to great depends on how it was brewed, here are a few things I think could benefit many homebrewers. 1.) Make an effort to find and use only the freshest ingredients. In the Northern hemisphere, hops are harvested only once a year, in the fall. In order to remain fresh, hops must be stored properly. If you are having trouble finding a source of fresh hops year round, consider buying what you’ll need around hop harvest time from a hop farm that deals with homebrewers. Then, store them — preferably in packaging that keeps out oxygen – in a non frost-free freezer. Unless you are purposely aging your hops, use them all within a year, then buy fresh hops the next year after harvest. Malt is produced year round. If you buy your malt by the sack, make an effort to find out when it was malted. Always smell your hops and malt before using them and chew a few kernels of your malt. Write down your impressions in your brewing notebook. In time, you will become better attuned to the characteristics of fresh hops and malt. 2.) Don’t skip any steps that have a purpose. For example, don’t skip the recirculation step to save time. Recirculation clarifies your wort so that you won’t need to boil as hard and as long to get adequate hot break during the boil. It also reduces the amount of grain husks in the boil, which can contribute to excess astringency. This is not to say that a more complex brewday is always better. Sometimes a short, high-temperature, single infusion mash will be superior to a long, temperature-stepped mash. However, most of the standard pieces of a full brew day are there for a reason. 3.) Boil your wort hard. Don’t settle for a wimpy boil. (Brew smaller volumes if needed.) In many cases, extending your 60-minute boil to 90 minutes will give you better break material — and hence clearer wort and later clearer beer. Also, adjust your boil pH, if needed, by adding a small amount (<50 ppm) of calcium to the boil. 5.) Do everything you can to keep oxygen away from your finished beer. This includes when dry hopping. 6.) Finally, step up your game when it comes to cleaning and sanitation. I know that this is the most boring part of homebrewing and the vast majority of homebrewers will say that their sanitation is “fine.” (I’ve found that even when beer is obviously contaminated, most brewers won’t admit to being lax with their sanitation.) But it’s not an all-or-nothing thing. All beers — even the best — are contaminated to some degree. I suspect, although I’ll admit I can’t prove, that beers can suffer negative side effects from contamination, even when the levels of contamination fall below that which produces obvious symptoms — sour beers, phenolic flavors and aromas, diacetyl, etc. I think that low levels of contamination can rob a beer of the “intangibles” that separate a good beer from a great one. I don’t think it’s a coincidence that homebrewers who are “OCD” about cleaning and sanitation tend to produce better beers. Along those lines, learn what sterile technique is. This is what biologists use when they need to minimize contamination in procedures, such as culturing specific bacteria or yeasts. You can’t mimic every bit of it in a brewery, but it will give you an idea of the mindset. Consider every un-sanitized surface to be coated with bacteria. (It is.) Consider there to be clouds of bacteria in the air. (There are.) Chilled wort or beer should never come in contact with any un-sanitized surface — and if you touch a sanitized surface, it is no longer sanitized. Chilled wort or beer should always be covered if it is exposed to air, for example during chilling or in a bottling bucket. Know when your wort and beer is the most susceptible and be doubly careful at those times. Get fermentation started as quickly as possible after wort chilling to suppress the growth of contaminants. Finally, keep in mind that improving your beer will likely require addressing the aspects of brewing you pay the least attention to. (Did you skip the sanitation section because it wasn’t what you wanted to learn about?) Alternately, it may involve getting a piece of equipment that will allow you to do something well, rather than just adequately. Brewing the absolute best beers requires effort. If it didn’t, everyone would be doing it. However, if you approach that pinnacle, you’ll be happy you made the journey. This is a surprisingly data-free article other than your observations on what qualities the best beers shared. Have you considered doing a follow up where you work with one or more of the brewers that entered middle-of-the-road beers and seeing if any of your suggestions actually resulted in higher scores in the next competition? You can’t get definitive feedback from only one competition. Different judges will score the same beer very different scores. A beer could get a 42 in one competition then a 34 in the next, it’s all about the group think, flight order, and luck of the draw on judges. If you are using contests for feedback, you should enter several, and focus on what the different judge pairs agreed on. I wrote this a couple days after the contest — and the judging is, of course, blind — so yes, I don’t have any data relating to fixing these exact beers. I should also point out that, some of the beers may have been past their prime. Many times, brewers who enter contests will keep entering a beer as long it does well. Eventually, it will get stale. Before that, it may simply lose some of its fresh character.